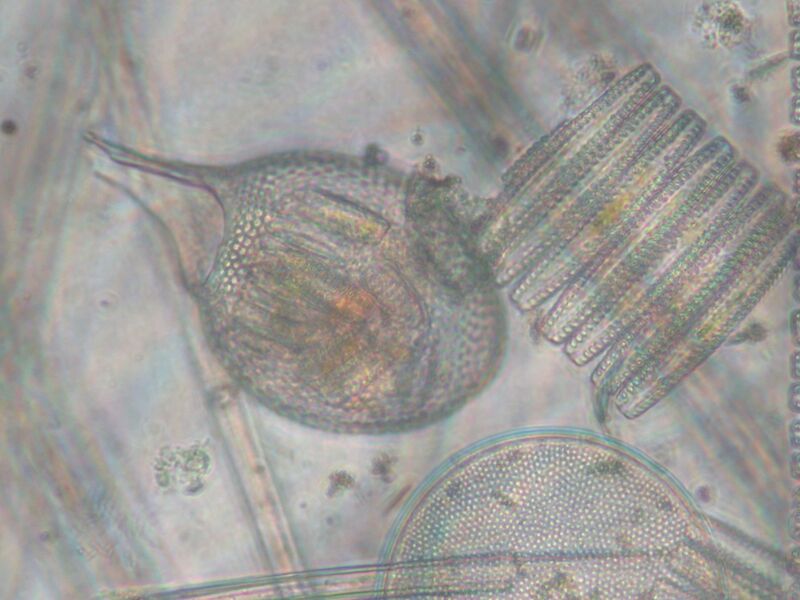 Photo of a live marine plankton sample (x400 magnification). Photo L. Armand. "Grass of the oceans", "Lungs of the Earth"
and "Base of the foodchain"
Marine phytoplankton represent all of these phrases when people or scientists speak about the Ocean's microscopic inhabitants, the phytoplankton. Phytoplankton are indeed the basic level of life in the Oceans, these diverse organisms represent the first step of conversion of light, carbon dioxide and nutrients through PHOTOSYNTHESIS into sugars for energy use and growth in the organism and oxygen as a byproduct, which we breath. So the phrases above are certainly representative of these organisms, especially when we also take into account that most other marine organisms rely on them as a food source, especially zooplankton. What is Plankton and what are the differences between Phytoplankton and Zooplankton? Plankton are plants and animal organisms drifting with the surrounding water and include the animals with weak swimming abilities. The word plankton comes from Greek word plangktos meaning wandering. 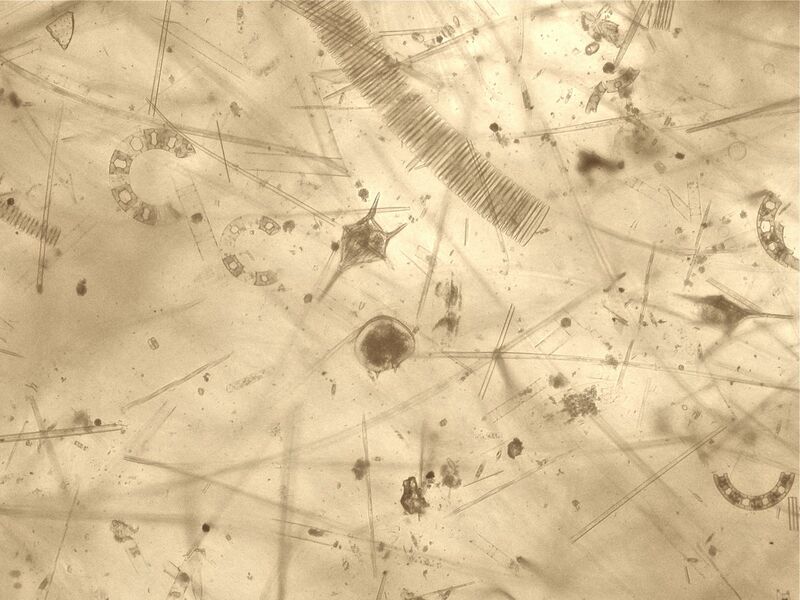 This photo shows a general sample view of plankton taken from a plankton net haul, it includes both phytoplankton and zooplankton examples. The image has been magnified under the microscope 200 times. Photo by L. Armand. Phytoplankton are the plant members of the plankton community, which are the primary producers of the oceans, meaning that they photosynthesize. This includes the diatoms that Leanne is studying. This word comes from the Greek words phyton meaning plant and plangktos meaning wandering. This photo shows chains of phytoplankton in a plankton sample. You can see their chloroplasts. This image has been magnified under the microscope 400 times. Photo of Fragilariopsis kerguelensis chains by L. Armand. Dr Pier van der Merwe talks about why phytoplankton are important in this video from ACE CRC. Zooplankton are the animal members of the plankton community, that generally consume phytoplankton. This word comes from Greek words zoon meaning animal and plangktos meaning wandering. This photo shows a zooplankton organism known as a radiolarian. 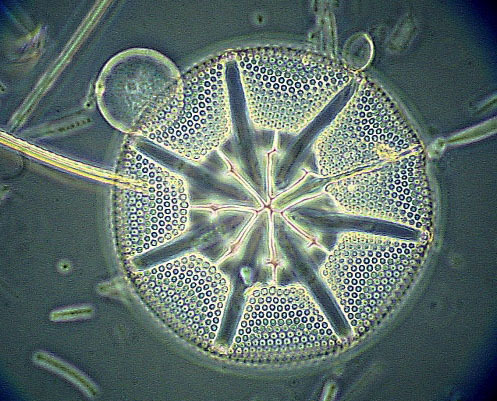 You can see that it has consumed some diatoms and is dissolving their contents inside its body cavity. Eventually the radiolarian will eject the silica frustules as they are not consumed. This image has been magnified under the microscope 400 times. Photo of Protocystis tridens by L. Armand. Diatoms are microscopic protists (not quite plants or animals but an organism that is considered a primitive, simply organised mostly unicellular organism with a nucleus). You will also hear them called microalgae and generally referred to as phytoplankton, which can also include many other microscopic photosynthesizing organisms. Diatoms are unicellular microorganisms ranging in size from ~2 µm to ~2 mm. They occur in practically all environments where water, nutrients and sunlight are available, this includes environments where the water is at 40°C in a hot thermal spring to where sea ice exists from -1.8°C. 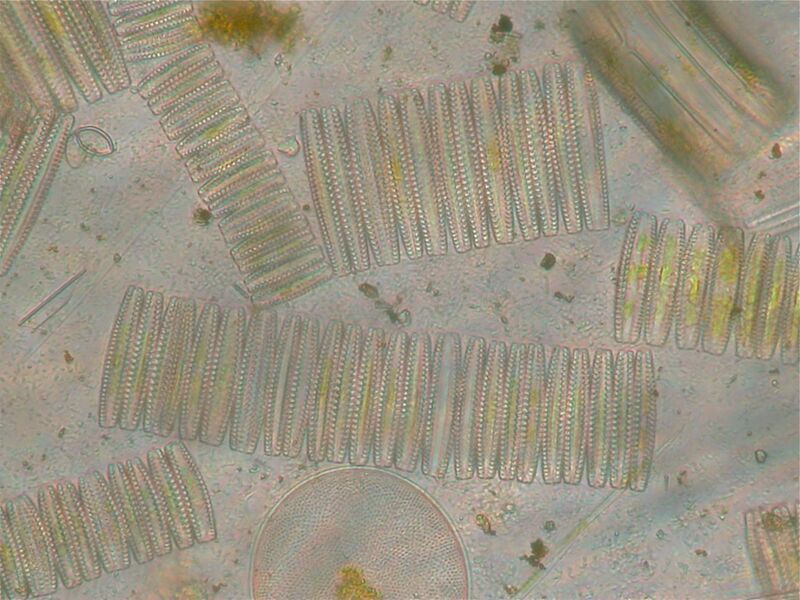 Diatoms have a silica-based skeleton, known as a frustule, which is highly decorative in pattern, structurally solid and generally difficult to dissolve. For this reason their skeletons are well preserved in the sediment as they less likely to dissolve on the way down to the sea-floor than other plankton that have calcium carbonate skeletons. Diatoms fossils hold a special role in marine palaeontology particularly in determining environmental change due to their very strong relationship to environmental conditions and the fact that they are amazingly diverse in frustule shape, pattern and structure. The other benefit is that they can be spectacularly intriguing to the human eye. 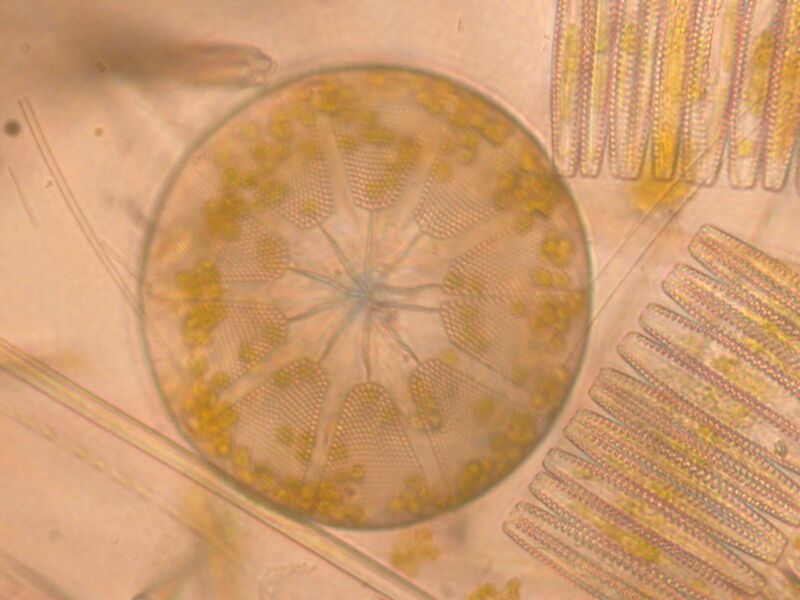 The two photos below show diatoms from the same genus Asteromphalus. In the first photo we can see the chloroplasts for photosynthesis as yellow-green circular plates. In the second photo we can see the fossilised silica frustule with the interesting structural patterns on the surface. These pattern and structural features are used to identfiy individual diatom species. 1) A live Asteromphalus hookeri from Kerguelen Plateau (x400 magnification). Photo by L. Armand. 2) A fossilised Asteromphalus parvulus from a seafloor core sample near Adélie Land, Antarctica (x1000 magnification). Photo by L. Armand.